What is "The Kays"? you ask? Is it a tropical resort?A coded password? A new action packed TV series? Nope! It's the homepage for Tuesdee Kaye and Brenda KayTwo web friends who met in a chat room called WWCD And who's friendship has carried them through wet monkeys And all types of little critters. Click on the left to go to Tuesdee Kaye's page. Click on the right to go to Brenda Kay's page. But be careful! We'll be watching!!!! Want to join the Andi's Friends Webring? 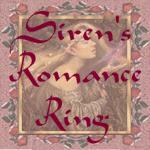 Want to join the Siren's Romance Ring? The ICQ Romance Ring .